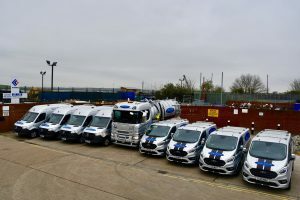 We are pleased to announce the purchase of 4 new Mercedes Sprinter vans, 4 new Ford Transit Custom Sport vans and a new Scania XT 26 tonne lorry (fitted with a Whale vacuum tanker body) as part of our new fleet rollout. 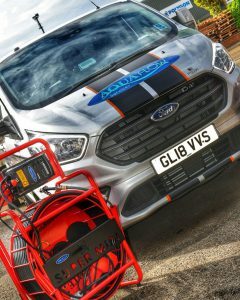 These have been fully sign written with our distinctive AquaFlow van wraps and are out on the road, ready to work. We are fully committed to providing a fleet worthy of carrying our iconic logo! This month, the Employee of the Month was a landslide winner, receiving the majority of the votes. Joe Borrett has really stepped up this last month with his attitude, diligence and standard of work having been exemplary. 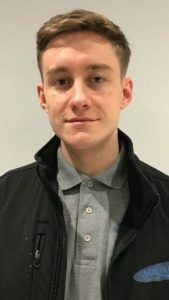 In addition, Joe recently attended a meeting at head office as the spokesman for the Engineering team and was articulate and constructive with his points, but also showing the maturity to listen to others and take on board other points of view. 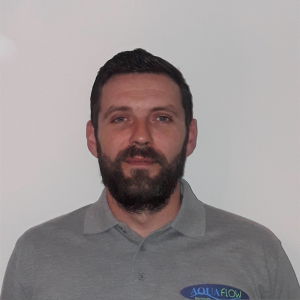 It’s safe to say that Joe is extremely deserving of the award this month and is proving to be a very strong member of a fantastic engineering team that we have at AquaFlow. At Aquaflow we pride ourselves on our service delivery, no matter what the situation or what hour of the day the support is required. To then receive such amazing feedback from a high profile client means the world to us as is further proof that our overall service is second to none. This weekend we had a blockage on a sewer that runs through our site. I was advised by a member of our staff to call the local water authority who advised me that they could send someone within 24 hours. I advised them of the severity of the situation and with much persuasion I eventually pressured them to send me someone sooner. An engineer from a sub-contractor subsequently arrived on site and attempted to unblock this sewer with his rods and then lost them down the drain! Fortunately he eventually recovered them! After five and a half hours sitting about doing absolutely nothing and a second sub-contractor vehicle’s arrival I was advised by said sub contractor that the sewer was not the responsibility of the local water authority and they immediately left site! This really left me up the creek without a paddle and with a possible catastrophic outcome should the sewer overflow (luckily it had stopped raining or it would have). 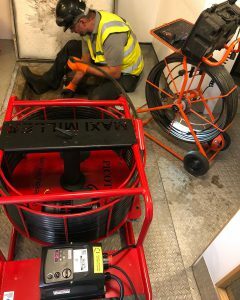 Through our property maintenance service contract company that we contacted, Aquaflow attended site promptly with the appropriate equipment to tackle this very serious issue. I can’t over emphasise how brilliant your company were and how Aquaflow really did save the day. Your engineers Oliver, Louie and Steve were absolutely fantastic! They quickly realised the gravity of the situation and immediately started offering up solutions on how we might resolve this serious issue. They demonstrated to me a level of expertise and professionalism that I found really impressive. I have been working in open spaces management for 34 years, 22 of those years as a supervisor and to have such a knowledgeable, supportive and friendly team come to site, so promptly, in the early hours of the morning was incredibly impressive and very refreshing (particularly after wasting so much critical time with the local water authority and their nominated sub-contractor). The handyman and I had tremendous problems finding an intermediate manhole on the night as the location had been lost due to previous ground works. This stopped us from initially clearing the blockage even though we had used the full run of jetting hose up and your team had explored and exhausted all other options on the night. Oliver and Louie gave us excellent advice and worked tirelessly on the night to resolve the issue and I was particularly impressed with their proactive approach, communication and their ability to develop an alternative action plan for the following day rather than just say we’ve done all we can do and leave. The handyman and I finally found the manhole in the very early hours of the morning and I contacted Oliver who very proactively came up with a plan, which would resolve the situation a few hours later. We had a management committee walk that morning who’s route co-incidentally crossed where the blockage was. Louie and Steve were there early on Saturday morning and done a fantastic job clearing the line avoiding any operational or reputational damage and lots of explaining to our consultative committee. Your out of hours office support was also great and very informative on expected service, equipment and estimated times of arrival. Your prompt attendance and highly professional team meant that we avoided a potential disaster and I can’t thank your company and particularly the team who attended enough for their support and ability to resolve the situation. We have been very fortunate to have witnessed some stellar performances over the year this year, all the way through the company from engineers, to office staff and the Management team. However, one person has stood out throughout the year, with his selfless attitude, his constant support to all those who need it, his pride in his work and his efforts to keep delivering the best possible service he can. He has a great desire to improve and constantly puts himself out, often to the detriment of his personal time, for the good of the company. In addition, and more important than anything, he is a great example to us all of how to be a nice person. He is respectful, honest, courteous and above all, kind. 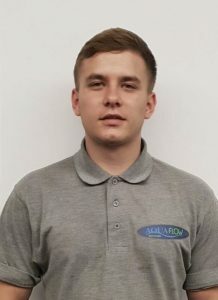 He is a fantastic advert for Aquaflow and you can see how much the company means to him. Everyone in the company has a great deal of respect for Louie, who was a very popular recipient of the award. Congratulations to Louie Dadomo on being awarded Employee of the Year – 2018. 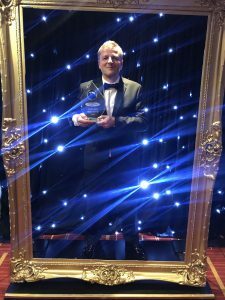 Our awards dinner was a great success and was a fantastic way to end what was another great year at Aquaflow. Our Employee of the Month for October is Hannah Thorne. Hannah is an important member of the Head Office team, working in processing and dispatch. 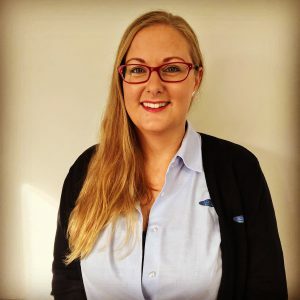 The last month, Hannah has taken her work to a new level, often assisting her colleagues at a detriment to her own workload, with her attention to detail and diligence being admirable. She is a very popular member of the team and we have high hopes for her continued development within her role. This month it gives us great pleasure to award Mikey Steward with the EOTM title because he has completely changed his approach to his duties and is becoming a great member of our team. His performance has massively improved and from a few months ago he has made a remarkable transformation, often being prepared to go above and beyond on various occasions this month. Mikey received the highest number of votes ever for one person in a month since we began this scheme. Keep up the great work Mikey. This month the award is given to Jon French. Jon is always full of enthusiasm, very hard working, helpful, punctual, polite and shows total commitment to his work duties. 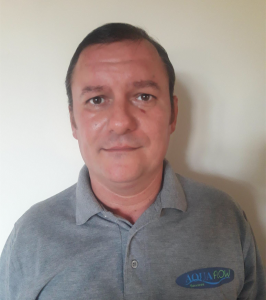 He has become a fundamental part of our pump division and it is a pleasure to have Jon as part of our team. Very well done Jon, keep up the great work. Aquaflow adopt new technology to provide a safer, cleaner , faster and more accessible type of cleaning process. Using specialist equipment which originated in Finland. Specifically designed to clean internal stack pipes reducing disruption as the process is quicker cleaner and move effective and less intrusive. With the capability to totally restore pipes affected by scale, corrosion, root intrusion and cement. The future of Drain Cleaning!